MSJ: This interview is available in book format (hardcover and paperback) in Music Street Journal: 2009 Volume 3 at lulu.com/strangesound. Can you catch the readers up on your history? I started writing and recording music quite some time ago. Pretty much as soon as I could play a few chords on the guitar, I started writing my own songs. Before long, I was borrowing my guitar instructor’s 4-track recorder and trying to make recordings of the songs. After the first few lessons, I was even playing rhythm guitar in my instructor’s band. Of course, it was a very small town in Tennessee and there weren’t a whole lot of players around, but I still felt like I was gaining some ground quickly with my new friends, the electric guitar and the multi track recorder. Eventually, I studied recording technology at Middle Tennessee State University and it was there that I learned the basic principles of using the various tools in a recording studio. I never finished college, but I did get a good grasp of recording principles as well as music theory, enough to apply them to my home studio and compositions. While I was developing my producing skills, I was playing in various bands, from strictly cover situations to entirely blues based groups and even an all-original modern rock act in Memphis. None of these situations ever produced anything that was released on any scale to the public though. Also, in all of these situations, I was strictly the guitar player and never attempted to sing anything. It simply wasn’t on my list of “things to do” I guess. It was nearly fifteen years into playing the guitar that I came to the conclusion that I really wanted to start developing my voice. I had always written lyrics to a great deal of my music, but never even considered that I could be singing them. The recording studio helped me out with this a great deal. Having the tools to be able to hear and critique my voice behind closed doors really helped me to develop and understand how to use my voice. In late 2006 I formed my own record label and my publishing company called “Blue Room Digital” to pave the way for my first official independent release which came out in March of 2007 called “Pathways.” Since much of Pathways was a cleaning off of the idea shelf; after I finished it I still had a great deal of new ideas I wanted to get recorded before embarking on any promotional efforts. So I immediately dove back into writing and recording a follow up which became Transformation. Now here we are in 2009. I’ve released my second CD. I’ve assembled some great players to help me support the project and we’re getting ready to finally get out of the rehearsal room and the studio to start playing the music live. I can’t wait! I would classify my music as progressive melodic rock. The music has some very definitive “prog” arrangements, but I do like to keep the structure of my songs much more simplified than most progressive compositions. I’ve heard many classify it as “album oriented rock” and I suppose that’s a label that also fits the material pretty well. MSJ: Who do you see as your influences – both personally and in terms of the band? Players like Jeff Beck, Joe Satriani, and David Gilmour are among a few of my favorites. Steven Wilson is someone I discovered recently and I’ve yet to hear anything from him that I didn’t enjoy. In terms of the band, many would compare what we’re doing technically, as a Rush-type power trio and we’re certainly following their lead in terms of applying technology to the show. We’re utilizing keyboard and acoustic guitar backing tracks that cue from a computer rig to fill out the sound. Rob keeps a click in his headset while Ryan and I follow his lead throughout the set. It’s actually working out really well so far. Someday, if things progress and the band takes off, we may add more players, but for now, this seems to be working and it really keeps things simple. MSJ: What’s ahead for you? I’m planning on spending the next year or so getting a tour going with the new band and promoting the CD’s. This will be the first outing promoting the music on my two CD’s and I’m really excited to spend some time playing this music live. I find that prospect extremely exciting! Even still, writing is something I can’t seem to turn off, so you can pretty much guarantee there will be some new unrecorded material in the show as well. MSJ: Are there musicians you’d like to play with in the future? Wow, there are so many great players out there and I’m always open to possible collaborations. I guess it depends on who I meet and what life brings about. I’m always open to the concept of “the jam” and it’s from these impromptu jams that great things usually start. I love to sit in and experiment with other players. That’s what it’s all about! That’s a tricky one isn’t it? What’s made it possible for an independent artist such as myself to start my own label, run my own studio, and produce and sell my own product, is also what is hurting the old business model which has failed to capitalize on the new medium. I think, without a doubt, downloading has hurt the major label business model. The industry’s attitude ten years ago was essentially to pretend the Internet didn’t exist and continue business as usual. Well, we all see where that has gotten everyone. Who’s to say the new independent model that’s emerging can’t turn into something wonderful and profitable for everyone involved? It’s a new ball game for sure. I’d equate it to the California Gold Rush or something. Right now everyone is clamoring and hoping to find the right place to dig. I hope when the dust settles, the major labels will figure out their new role and the artists will take on a new level of responsibility for their careers. It really sounds like what artists always wanted, right; creative control and the freedom to create what they want? The downside of this is that the artists really must function as the managers of their own career now more than ever. The days of A&R seem to be gone for good. Downloads or not, there is bound to still be a way to sustain a small business based on music. There may not be multi platinum albums anymore, but when managed properly, the demand for music is there, so there’s bound to be a way to capitalize on this demand and survive as an artist and as a business. It would appear we’re in a period of serious regression in terms of the music business. We’re crawling back to the days when it’s all about the single again and not about the album anymore. I find this trend depressing to say the least as an artist, especially since my favorite albums are entire albums, not just one song on an album. Most of the CD’s that I bought back in the day that only have one song worth going back and listening to, I probably am more likely to collect the mp3 of that song than I am to hold on to the physical disc. So, I think there’s a balance for everything, downloads or album sales; we’re just not there yet in terms of finding that balance. The old business model has to develop and must embrace the current trends to survive. Fighting it or ignoring it, in the end, is not going to accomplish anything for anyone involved. One thing’s for sure, the internet as the new medium for music is not going to go away anytime soon so it seems, so we should be looking into new ways to make things work. I say let the fans be fans. As long as someone is not trying to market and sell a product for financial gain without permission; trading shows is a great thing. It spreads excitement and enthusiasm about the music and as an artist, that’s what you hope for from a fan. I actually hope to sell downloads of live performances from my website in the future. It seems like a great way to get a “band approved” recording out there for the fans to buy as a keepsake. Even if it was just a couple of songs that were recorded at the show you went to the night before, it would be a great $3 souvenir. Never been asked that one before! If I were a superhero, hmmmmm, I guess I’ve always seen myself as the “Batman” type and his nemesis is the Joker so, who would the joker be in terms of the music industry? I think I’ll just leave that one alone. MSJ: If you were to put together your ultimate band, who would be in it? Well I must say I’m thrilled with the guys that are playing with me at the moment but if I was daydreaming about an all-star jam? Gavin Harrison on drums, Geddy Lee on bass, Rick Wakeman on synth, Steven Wilson and myself on guitars and vocals! Sounds like a good time to me. MSJ: If you were in charge of assembling a music festival and wanted it to be the ultimate one from your point of view, who would be playing? Well, in terms of bands and performers that are still at it: Rush, David Gilmour, Porcupine Tree, Jeff Beck, U2, Joe Satriani, Sarah McLachlan, Imogen Heap - to name a few. The last CD I bought was Imogen Heap – Speak For /Yourself, she’s a truly talented songwriter and producer with an amazing voice. Awesome album! I’ve also been listening to Porcupine Tree’s Nil Recurring and Steven Wilson’s new solo album as well as a band from Germany called RPWL. I also recently got a re-mastered CD of Marillion’s Misplaced Childhood that’s been spending a good bit of time in the car CD player. I guess it’s been awhile since I went to a show. I’m thinking that it probably would have been when Rush came to town last summer. Great show! My drummer, Rob, has a friend that works for them, so we actually got prime seats, VIP passes and even a meet and greet with Geddy and Alex. Sweet indeed! MSJ: Now, this one some love, some hate. Feel free to not answer if you don’t care to. What has been your biggest Spinal Tap moment? I guess I’m lucky in that my biggest Spinal Tap moment (so far anyway) would have been one of my first cover gigs I ever played. It was sort of like the air force base gig in the movie, only we were a metal band playing at a church camp. Big mistake! Seriously, all I can remember is that we played “Heavens on Fire” and “Shout at the Devil” and then we actually got paid to stop playing! Yes, it was in the 1980’s. I’m really looking forward to getting this show out there and sharing it with people. The band and I are still at the very early stages of things and are on the lookout for booking, promoter and management contacts that can climb on board and help out with the tour. We do it for the love of the music and for the joy of sharing it. 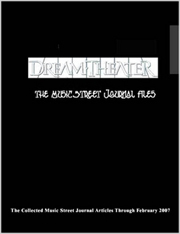 Hope to see all of you Music Street Journal Readers out there soon!